Indexes for birth, marriage and death records may be searched by the general public at the office of the County Clerk. An application to request a copy of a vital record is available online at the County Clerk’s web site. Contact the County Clerk’s Office for business hours and photocopy fees. Marriage Record Index: Vol. I, 1837-1893; Vol. II 1893-1908. MCIGS has published the State Board of Health Returns for marriages from 1837 through 1899. See Publications. An Index to Marriage Records in available in the County Clerk’s Office – ask for the one created by MCIGS which is more complete than the original. Death Record Index: Vol. I, 1878-1905; Vol. II 1905-1916. Indexes are alphabetical by the first letter of the surname. These records are incomplete, as not all deaths were legally required to be reported prior to 1916. After 1915, you must know the death date in order to obtain the record. Birth Record Index: Vol. 1, 1877-1905; Vol. II 1905-1916. Indexes are alphabetical by the first letter of the surname. These records are incomplete, as not all births were legally required to be reported prior to 1916. After 1916, there are some restrictions imposed on obtaining birth records. Probate Index: 1836 to the present. Ask to see the indexes to the probate records and the wills filed. Find the file number in the index and give the number to the clerk when requesting to see the file. (Note: The old probate files are being stored in another location, away from the Government Center. They may be ordered and will then be available to you after noon on the next business day.) Contact the Circuit Court Clerk’s Office for business hours and photocopy fees. FamilySearch has also scanned the probate indexes for McHenry County for online browsing. Deed Record Books. The INDEX to the GRANTOR (seller) or GRANTEE (buyer) INDEX is now available online. Using the Document Number found in the Index, you can order the document by sending a letter of request, with your credit card information, including the number on the back of the card, to the Recorder’s Office. Contact the County Recorder’s Office for business hours and photocopy fees. Tax Records from 1850 to the present are available on microfilm. There are a few before 1850 on the first reel of film. The arrangement of townships on the film is: Riley Twp., north to Chemung Twp. ; Alden Twp. south to Coral Twp., Grafton Twp. north to Hebron Twp. ; Richmond Twp., south to Algonquin Twp. Each township has the REAL ESTATE LIST first. This is by tract description, not alphabetical by owner of the property. The PERSONAL PROPERTY LIST follows each Real Estate List and is alphabetical by the first letter only of the surname. Contact the Treasurer’s Office for business hours and photocopy fees. An Inquest and Death Record Index will be available online at both the Coroners’ website and at the MCIGS website by the end to 2012 or later. Prior to that time, you must contact the Coroner’s Office for information and photocopies. The Coroner’s Office does not have an existing index of any kind. To receive copies of Inquest Records, you must know the approximate date of death and the full name of the deceased. Contact the Coroner’s Office for business hours and photocopy fees. History of McHenry County, Illinois. Vol. 1. Chicago: Munsell Pub. Co, 1922. History of McHenry County, Illinois. Vol. 2. Chicago: Munsell Pub. Co, 1922. History of McHenry County, Illinois: Together with Sketches of Its Cities, Villages and Towns : Educational, Religious, Civil, Military, and Political History : Portraits of Prominent Persons, and Biographies of Representative Citizens, Also a Condensed History of Illinois. Chicago: Inter-State Pub. Co, 1885. Bateman, Newton, Paul Selby, and A. L. Wing Coburn, eds. Historical Encyclopedia of Illinois: Including Genealogy, Family Records, and Biography of McHenry County Citizens. Vol. 1. Chicago: Munsell Pub., 1903. Bateman, Newton, Paul Selby, and A. L. Wing Coburn, eds. Historical Encyclopedia of Illinois: Including Genealogy, Family Records, and Biography of McHenry County Citizens. Vol. 2. Chicago: Munsell Pub., 1903. 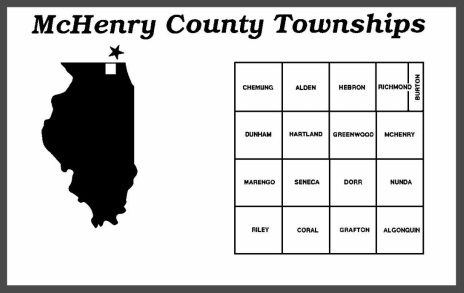 McHenry County in the Twentieth Century, 1968-1994. Union, Ill: McHenry County Historical Society and Heart Publications, 1994. MCIGS has published four (4) volumes of cemetery records, covering every known cemetery, both extant and abandoned, in the county. Records date from the inception of each cemetery to the publication date. See Publications for additional information. The microfilmed newspapers for the Crystal Lake area, dating from 1875, are at the Crystal Lake Public Library, 126 W. Paddock St., Crystal Lake. MCIGS has indexed the newspaper’s marriage and death notices from 1880 through 1979. See Search Ancestors. The Crystal Lake Historical Society also maintains an index current up to 1995. The McHenry newspaper dates from 1875, and is available on microfilm at the McHenry Public Library District Library, 809 Front St., (Hwy. 31), McHenry. Death notices have been indexed from 1875 through 1880 and are available online. See Search Ancestors. Obituary indexes covering the years 1949-1984 of the Plaindealer were printed in volumes XXV, no. 2 - XXVII, no. 2 of the MCIGS Connection Quarterly. See the table of contents for specific details. Learn more about this history of this newspaper. The Woodstock Sentinel and a few other early newspapers are at the Woodstock Public Library, 414 Judd St., Woodstock. The Woodstock Sentinel was a major county newspaper for many years and should be checked for columns written about other towns. Death notices have been indexed from 1856 through 1894. Abstracts of Notices Published in the Woodstock Sentinel 1856-1862, 1863-1866 have been published by MCIGS. See Search Ancestors and Publications. The Harvard newspapers date from 1867, but not all issues are available until after 1898. Harvard Diggins Library, 900 E. McKinley Street, Harvard. Microfimed copies of the Marengo newspapers from 1865 (some years and issues are missing) are at the Marengo - Union Public Library District, 200 S. State St. Death Notice Indexes are available from 1872 through 1954, 1970 through 1979. See Search Ancestors. MCIGS is currently working with MCHS to digitize pre-1923 newspaper issues. In partnership with the McHenry County Historical Society, MCIGS helped fund the digitization of select issues of the Richmond Gazette/Nu Vue News from 1880 through 1950, two issues of 1961 and a fairly complete run from 1963 through mid ­1985. The early Richmond newspapers are scant, but most issues from 1947 through 1985 are on microfilm at the Nippersink Public Library District, 5416 Hill Rd., Richmond. The McHenry County Historical Society has some old issues as early as 1880. Check other county newspapers for columns about Richmond. Founded as the Arlington Heights Herald in 1871, the newspaper became the Daily Herald in 1977. During the second half of the 1980s, it expanded into DuPage, Kane and McHenry counties. Daily Herald Story Index, 1901-1964 is available online. The index consists of an alphabetical list of subjects covered by the Herald during that time period. Under each subject heading is a list of headlines describing the articles and the date of each article. This library houses MCIGS's collection of books primarily pertaining to New England, Maryland, New Jersey, New York and the British Isles, as well as all of the McHenry County Records published by MCIGS. CLPL compliments the MCIGS collection with a very good collection of their own genealogical materials, pertaining primarily to New York. Visit their website for locations, business hours, online card catalog search and photocopy fees. In the LOCAL HISTORY and GENEALOGY ROOM, located at the back of the Main Reading Room, there is an excellent collection of Illinois and McHenry county materials as well as a variety of other genealogical sources. Note: In general, this room is locked and you should stop at the Adult Reference Desk and request that they open the room for you. Included in the collection are McHenry and other Illinois county histories, various published IL county vital record books, census records, Public Domain Land Sales with a separate name index, a listing of McHenry County Veterans, and much more. With the exception of the New England, Maryland, New Jersey, New York and British Isles collection housed at the Crystal Lake Library, the remainder of the MCIGS library collection is housed at the MPLD including all of the McHenry County records published by MCIGS. Visit their website for location, business hours, online card catalog search and photocopy fees. Of interest: LOCAL SURNAME INDEX CARD FILE to persons in the unindexed county history books, as well as special editions of the Woodstock Sentinel newspaper. The library has a complete collection of the county's history books and atlas/plat books. Visit their website for location, business hours, online card catalog search and photocopy fees. Many documents and records of genealogical interest can be found in the library of the McHenry County Historical Society Museum. The Museum is open from May through October. Library Research facilities are open year round, by appointment only. Appointments should be made at least 24 hours in advance. Some items that are unique to the museum library are files containing newspaper articles pertaining to McHenry County towns; a biographical file of some of the county's past and present citizens; some published family histories; an obituary file; property owner maps; scrapbooks, diaries, Bible records, and many more items of general interest to anyone doing research in McHenry County. Please be aware that absolutely no computer/scanning of any items is allowed, no exceptions! Contact the Society for Museum and Library hours and photocopy, admission and membership fees. The Family History Center is located at 5209 Walkup Road, Crystal Lake; phone 815-459-7475. Access to the Center is at the back entrance to the church of Jesus Christ of Latter Day Saints. Call ahead to confirm the times they are open and to reserve a microfilm reader or computer. First time users of the Family History Center should request a brief overview of the Center’s facilities, how to order microfilm records, etc.